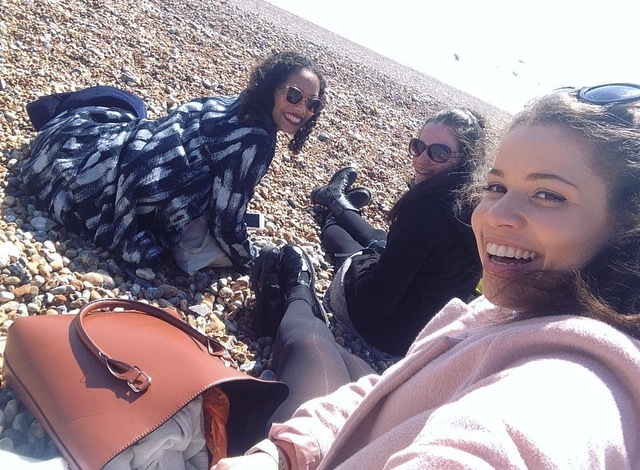 So last week I had such a fun trip to Brighton with my friends Naomi and Alice. It was a pretty spontaneous trip. I had the idea to get out of London somehow and after binge watching Zoella’s vlogs, I decided Brighton could be a really lovely day trip! I haven’t been to Brighton since around 2010, when my first boyfriend lived there for Uni. I used to visit almost every other week! It felt nostalgic but also great to be back in the little town by the sea, creating new and longer lasting memories with my gal pals. Here is a round-up diary style blog post about what we got up to. If you are thinking of a day out of London or even a trip from farther away, I hope this post will provide you with some inspo or even some nostalgia if you may have visited before! Was up fairly early to try and make the most of this beaauutt weather! *Emoji heart-eyes face! * The sun was shining brightly as I made my way to London Bridge station to meet the girls. I was last to arrive (as usual) sigh, but it was lovely to see everyone and how excited we all were! The train took about an hour, and after watching the cityscape view evolve into the beautiful countryside, we arrived safely at Brighton Station. The fresh sea air literally hits you as soon as you exit the station. Perhaps a local may be accustomed to the salty whiff; however our foreign noses revelled in this new and refreshing smell that brought back so many memories of near and distant memories. We made our way down the main hill leading to the station in search of a snack for Naomi and a bathroom for Alice! We found our way into Holland and Barrett’s to pick up a snack and then Waterstone’s bookshop to cheekily use the 4th floor cafe loo! Onto the main event; Shopping, Sea and Sun! I managed to grab myself a wooden chopping board. I know, I know “why would she get that?” but hear me out. So I thought it would be a nice idea as a serving board/platter for cheese and bread and nibbles etc when I have guests over. Kinda rustic and homely. Haha, I’ll post a picture of it when I get to use it to show you what I mean. Anyywayy, after an hour of browsing, we all made our purchases and decided to head out to the infamous “Lanes” for some shopping and a meal. The sweetie shop was really old school and traditional. It smelt amazing but because we were quite hungry, it was super hard to restrict ourselves! So we decided to get a proper meal and do sweets later. A few more shops along, past the alluring Blackbird Tea rooms, we spotted a “2-4-1 Mexican” sign and were immediately sold! Basically, among our group there is 1 vegetairan, 1 pescatarian, 1 gluten free and 2 dairy free (none of which apply to me haha) so it can be hard to find a place we can all eat, but the ‘Dos Sombreros’ menu seemed to cater for us all nicely! Naomi and I ordered cocktails at two for £11.95. We decided on a “Mexican Woo Woo” which was SO tasty and pretty strong! We were nice a tipsy for the arrival of the main. The portions were nice and big. I went for an Beef Enchilada, while Naomi went for a packed Burrito and Alice some stuffed peppers. We all had the sweet potato fries on the side which were fantastic. I feel like sweet potato fries are always hit and miss depending on where you are eating; but these were yum! After stuffing ourselves, we head off to continue our journey around the Lanes. This is why I love Tiger! Tiger is one of my favourite shops ever for everything! From kids a toy to kitchenware, this shop has it all covered and the Brighton branch certainly didn’t disappoint! I managed to pick up a really cool table dish for throwing jewellery and bobby pins etc. 2.45pm- I can See the Sea! I decided to create my own rock “collection” to take home, so Alice and Naomi would present rocks to me and I had to accept or reject them like some kind of beachy next top model! It was a little chilly by the sea, so after a while of sniffing and dodging seagull poop, we decided to head off to find our next tourist landmark-the Pavilion. Of course, the shops en-route weren’t left untouched as we found Lush! I even bagged myself a free hand massage from one of the nice staff members as we talked all things rose scented and unicorn horns! Lush; If only you could smell the screen! We found the Pavilion and had a walk through the little park opposite. Alice is another avid herbal tea drinker so we decided to find a cafe for something to help digest the settling Mexican. We stumbled across the Brighton Theatre and the built in cafe. The alfresco seating was super cute so we ordered and sipped whilst watching the shoppers and students. There was also a street performer who created huge bubbles with some long sticks and ropes which turned out to be fairly entertaining to watch! We also had a go in the photobooth at £3 for four poses. We darnt use the straggly, lice-ridden props and wigs so we just played around with our own sunglasses. We decided to make the shopping centre our final stop before heading back to London. But as we wandered through the cemtre, past the half-closed shutters and tidy stores, we slowly began to realise that the shops were all closing for the day! At SIX PM!!?? Whaattt?? This would never happen in London we all gasped! Haha! We soon realised that there would be no point actually going into any shops as we wouldn’t be able to look without feeling rushed so we headed to the outdoor shops hoping they may open later. We were correct, by half an hour! I trawled the rails of the New Look sale and managed to find a lot of bargains which I modelled for the girls who were ‘resting their legs’ on the comfy changing room sofas. I decided to buy a white, long sleeve bardot top (I only have cropped short ones at the moment but love the idea of wearing it in summer!) and a Christmas jumper. I know, I am waayyy off, but it was so cute I couldn’t resist! It is a super soft black jumper with two Christmas puddings on the boobie sections! Alice wasn’t sure if I knew that the pudding placement looked like boobies, so she tried to tactfully tell me. Little did she know, I LOVED the boobie placement! Haha. After a little look through M&S as a time filler, we slowly made our way back up to Brighton station. We were well and truly pooped out! Lots of walking and lot’s of laughing led to three tired girls. The hour and twenty minutes passed by as we watched the sunset from the train window whilst reminiscing about our day and began planning our next adventure! I think the word IKEA was tossed about which sounds like so much fun! Stay tuned for that! Has this post inspired you for a UK Daytrip? Let me known in the comments or via Twitter!